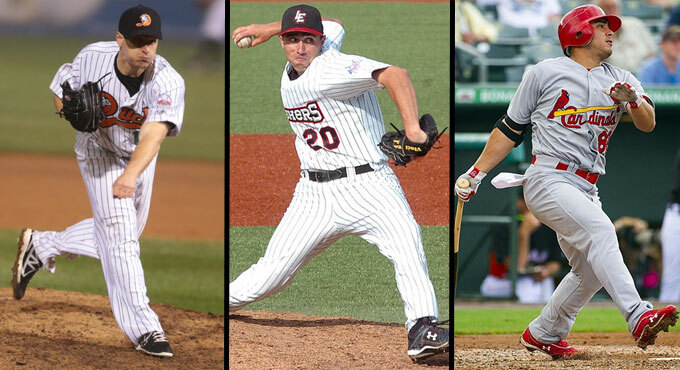 (Central Islip, N.Y., March 17, 2015) – The three-time Atlantic League champion Long Island Ducks today announced the signings of left-handed pitcher Eric Niesen, right-handed pitcher Mickey Jannis and outfielder Erik Komatsu. Niesen returns for his fourth season with Long Island, while Jannis and Komatsu will make their Ducks debut in 2015. Niesen spent the entire 2014 season with the Ducks, appearing in a team-high and career best 59 games out of the bullpen. The southpaw compiled a 4-3 record with a 3.06 ERA and 65 strikeouts in 53 innings of work. He made 15 consecutive appearances without allowing an earned run twice during the year (April 25-May 23 and June 6-July 18). The Michigan native began 2013 with Long Island and went 4-0 with a 3.23 ERA in 35 games. He was then signed by the Boston Red Sox organization and went on to pitch 12 games with Double-A Portland and two with Triple-A Pawtucket. The 29-year-old’s first season with the Ducks came in 2012 when he posted a 3-2 record with a 3.89 ERA in 57 games (two starts), helping the Flock to the first of two consecutive Atlantic League championships. The Wake Forest Alum has played eight seasons of professional baseball, including five with the New York Mets where he reached as high as Double-A Binghamton. Niesen was originally drafted by the Mets in the third round of the 2007 amateur draft. Jannis comes to the Ducks after splitting time in 2014 with the Lake Erie Crushers of the Frontier League and the Southern Maryland Blue Crabs of the Atlantic League. He made 12 starts with Lake Erie, going 3-4 with a 4.45 ERA and 57 strikeouts in 64 and two-thirds innings. Upon shifting to Southern Maryland, the Nevada native compiled a 4-1 record over 10 starts with a 2.37 ERA, one complete game and 36 strikeouts in 57 innings of work. The right-hander began his career in the Tampa Bay Rays organization, reaching as high as Single-A Charlotte. He went on to pitch with Lake Erie in 2012 and 2013 and made 10 appearances with the Bridgeport Bluefish in 2013. Overall, the 27-year-old knuckleballer has a 24-20 career record with a 3.14 ERA, 14 saves and 311 strikeouts in 139 games (37 starts). Jannis was originally drafted by the Rays in the 44th round of the 2010 amateur draft. Komatsu brings 30 games of Major League experience to the Ducks. He split time with the St. Louis Cardinals and Minnesota Twins in 2012, combining for 11 hits, one RBI, five runs and six walks in 51 at bats. The California native has also spent time with the Milwaukee Brewers, Washington Nationals and Los Angeles Angels organizations during his seven year career. The 27-year-old combined to play 99 games with four different teams at the Double-A and Triple-A level in 2014, totaling six home runs, 25 RBI, 24 runs and nine doubles. His best season came in 2010 with Brevard County (A+, Brewers) when he posted career highs in nearly every offensive category and was named a Midseason and Postseason All-Star. In 494 minor league games, Komatsu has a .279 batting average, 33 homers, 206 RBI, 477 hits, 90 doubles and a .989 fielding percentage. He was originally drafted by the Brewers in the eighth round of the 2008 amateur draft.